Jupiter's innermost large moon, Io, is one of the most dramatic bodies in the Solar System. It's the most volcanically active thing we've ever seen, and its surface is spotted with pools of liquid sulfur and punctuated by some of the largest mountains in the Solar System. 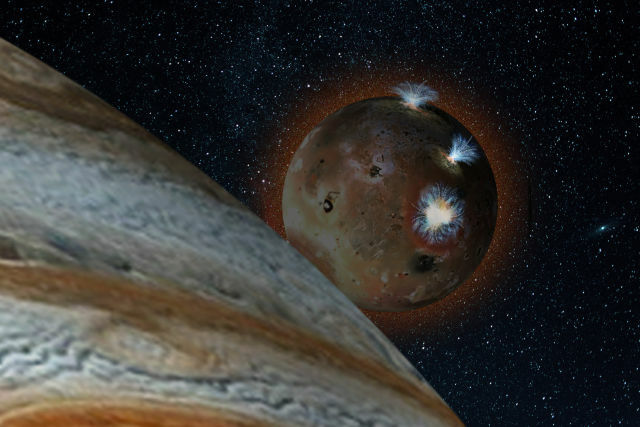 The Jovian environment bombards it with intense radiation, and the giant planet's magnetic field sweeps away material from Io and sends it on to other moons. Now, researchers have found evidence that the moon's thin atmosphere has its own dramatic behavior, condensing and collapsing to the surface whenever deprived of sunlight. In making this discovery, we've probably also learned where the atmosphere originated. The atmosphere of Io doesn't make it the sort of place you'd want to draw a deep breath. For one, it's incredibly thin, so nothing like a deep breath would even be possible. But the kicker is that its major component is sulfur dioxide, which would react with the water in your lungs to form a strong acid.